Aunty Felicia's daughter, Zoe turned one month old and she dropped by on Sunday to give us some cookies. I did get a peek at Zoe in the car and I wanted to give her a kiss, but since she is still a little baby, Mom wouldn't let me get too close to her. Zoe, when you get bigger, I would let you ride on my back! 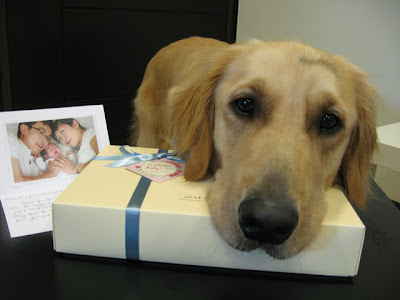 Here is the cookie box with a nice card and photo of the family. Wow! 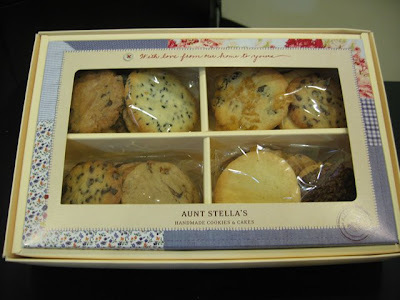 A whole box of Aunt Stella's cookies! Can I have some if I pose nicely? No? How about a big smile then? Still no? Then what if I say a prayer? Nevermind! 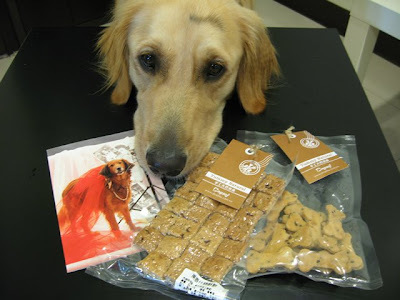 Aunty Felicia was really thoughtful and even got two packs of delicious natural doggie biscuits for me. One was made of sweet potato and another one had some cranberries in them. 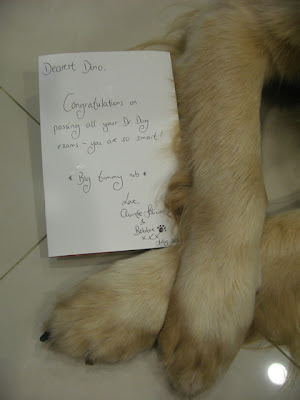 I also received a card from Aunty Felicia congratulating me for becoming a Dr. Dog. See the golden on the card? 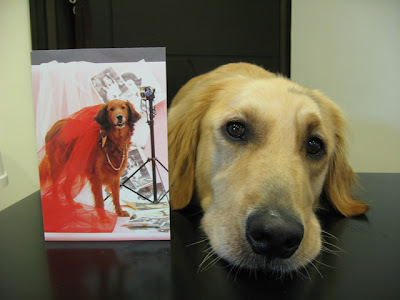 That is one diva golden! Time to show off another new trick: Cross your hands! Here's the sweet message in the card. 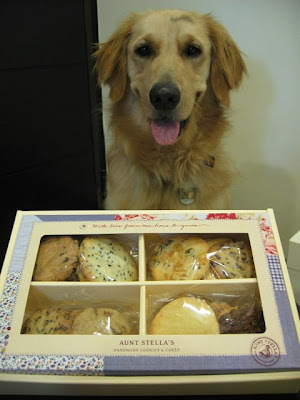 Thank you so much, Aunty Felicia for all your nice gifts! Muah! You got yummy presents from your Auntie! Glad you like my pictures. I love yours too! What a great presssies you got! Yum... Your Auntie Felicia looks so cool! I like the Cross your hands trick! Beautiful pics! 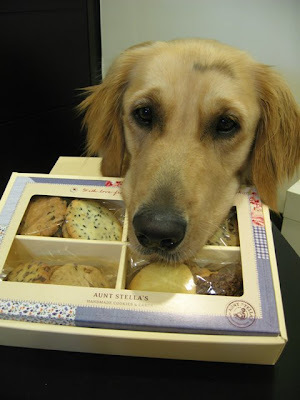 Awww, that is sooo nice of your Aunt to send you such loverly goodies. 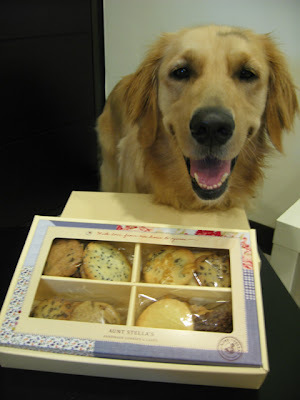 I ebt the treats were delish! You look like a gent when you cross your paws like that. 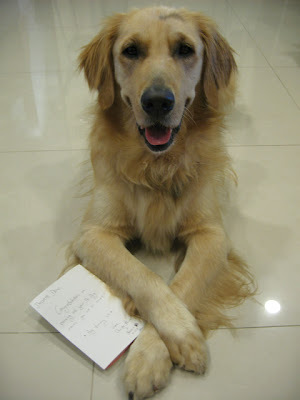 Hi!Dino.I Think Your blog is refined.I enjoyed my birthday. Hi Momoko, thanks so much! * MUAH * Zoe asks when can she ride on you?